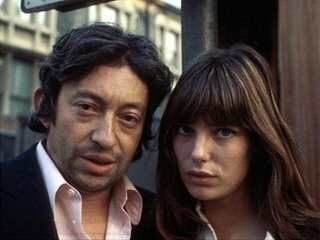 Jane Birkin is perhaps best known for jumping up and down on David Hemmings bed in Antonioni's Blowup (1966) as a teenage groupie. But when the famous photographer Hemmings plays takes her fawning serious she realizes the game is too rough for her. Later she is to star opposite singer/songwriter Serge Gainbourg in Je t’aime moi non plus (1969) - also a legendary pop hit - and marries him in real life. Jacques Rivette puts her range of acting talents to use in L'Amour Par Terre (1983) opposite Geraldine Chaplin, a three hour spectacle of young actors commisioned to perform theater in the elaborate home of the wealthy Roquemaure. Rolled up shirt sleeves, roomy Manchester slacks and slippers, she exemplifies the finess of androgyny that makes her perfect for roles in films like Kung Fu Master (1987) by Agnès Varda. Now at 60 Birkin has cut a new CD using material from songwriters such as Neil Hannon, The Divine Comedy, The Magic Numbers, Beth Gibbons, and Rufus Wainwright. Fictions will be released March 20 by one of the most versatile Francophiles of the screen. Birkin was honored with a special retrospective at the 28th Créteil International Film Festival (March 10-19), sporting what else? Rolled up shirt sleeves and roomy slacks. For the Soirée Gala on March 11th, she selected Jacques Doillon's La Pirate (1984) - a film where she was allowed to play a "plain Jane".